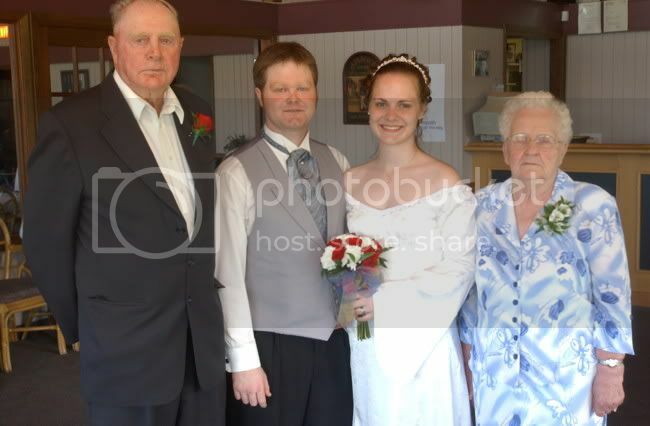 Our wedding day July 15, 2006 with John's Grandparents. We spend a lot of time waiting to hear about my Oma these days. Our stomachs drop every time the phone rings. It rang at 3am on Tuesday. Johnathans grandmother suddenly passed away. My heart hurts for him. There is a reason for us being here. There is a reason we're both going to lose our paternal grandmothers so close together. There is a reason this is happening whilst we're here. But we'll be damned if we know what it is right now. My condolences go out to you and John, it's hard not being able to be there when something this traumatic happens.